This is a work in progress…and is not meant to step on Mike McMahon’s toes who has been doing an excellent job at cataloging this information. For in depth profiles of candidates (who bother to submit them) visit SmartVoter.org. If anyone is aware of any other endorsements or relevant links, please let me know. Lauren: Not consider it stepping on my toes when someone takes the time to provide information to the public. Keep up the good work. Immer mit der Ruheâ€‰â€”â€‰und richÂ­tig recherÂ­chieÂ­ren :mrgreen:Es sind genauÂ­geÂ­nomÂ­men pro Stunde 100 und pro Tag max 2.oâoâ€‰â€”0€‰F4ll0ws, wohlÂ­geÂ­merkt, wie du schreibst. Ich wÃ¼rde aus diverÂ­sen GrÃ¼nden nieÂ­manÂ­dem, der seiÂ­nen Account behalÂ­ten mÃ¶chte, empÂ­fehÂ­len, das Limit voll auszureizen.ABER: Diese EinschrÃ¤nkung gilt ersÂ­tens nicht fÃ¼r API calls und zweiÂ­tens kÃ¶nÂ­nen dir pro Tag belieÂ­big viele User Followen. Hummingbird ist aber in der Tat Schwachsinn, da gibtâ€™s besseres. I am just incredulous that during the governors’ debate Arnold Schwarzenegger said he has the “highest respect” for police officers, after all he claimed his dad was a police officer. Lest the public forget the governor’s father was a member of the Nazi storm troopers also known as the brownshirts. A Nazi is who Arnold looks up to. Please California do not put this man back in offfice. This is my first time to visit this site. I find it very interesting and informative. If you do not mind, I will come here more often and perhaps participate. Will Our November 7 Votes Count? League of Women Voter members in Alameda County have been observing and working closely with the Registrar of Voters Office for more than a year an a half to make sure that our election system is working well. Guiding our work has been the LWVUS standard—SARA—voting systems should be Secure, Accurate, Recountable and Accessible, as well as the basic League tenet that voting is a fundamental citizen right that must be guaranteed. Four League members serve on the ROV’s Citizen’s Advisory Committee; two League members serve on the ROV’s Logic and Accuracy Board. Overall, League observers found the ACROV conscientious and meticulous in carrying out its work. Election equipment and software are only part of an election system. Well trained staff and systematic procedures are key elements; they are essential to carry out a secure and accurate election. New Acting ROV Dave Macdonald, who also heads the County’s IT Department, has expanded and improved the tracking and testing of equipment and systems, upgraded the training of the existing staff and brought with him from IT staff with computer expertise. An independent firm was hired to do a vulnerability assessment. The firm identified only a few weak points that the ROV needed to correct. The report is posted on the web at http://accurate-voting.org/wp content/uploads/2006/10/alameda_sequoia_vuln.pdf. The ROV is making all the corrections suggested in the report. A full report of League observations of the November 2005 election, “How Our Votes Are Counted,” is posted on the Web at http://www.lwvbae.org/acc_rov.htm. Although some details of the system described in this report will change at this election, the overall descriptions will still be relevant. This election will provide a strenuous test for the ACROV since the County has brand new voting machines and a new voting system, from a new vendor, Sequoia Voting Systems. The Board of Supervisors made their purchase decision only just in time for the fall election; equipment began to arrive at the end of August. The Registrar of Voters staff had to work very quickly to learn the new system, to adapt existing training for poll workers and temporary staff, train them and to study and test the new systems. Because of concerns raised by citizens about the security of electronic systems, the Board of Supervisors required the ROV to add extraordinary safeguards for this election—including independent testing and a full hand recount of all votes cast on touch screen machines. All voters will be able to review their ballots before casting them; all ballots will have a paper backup. Most votes will actually be cast on paper ballots. Disabled voters–or voters who wish to do so–will vote on a new touch screen machine which will also print their vote on a paper roll; those who vote with an audio ballot will be able to listen to an audio replay. The ROV desperately needs poll workers. If you are able to help, please contact them at the Alameda County web site. We just received our Absentee Balots and will probably fill them out and send them in this week. Full information on each of the propositions can be found on http://www.smartvoter.org Just enter your address, and your ballot will come up. Click on any of the propositions (or candidates) and get a ton of info. Alameda Transit Advocates (http://www.alameda-transit.org/#contact) has endorsed Elsa Ortiz for AC Transit Board in District 3. She is the superior candidate. Unfortunately, Tony Daysog did not respond to our requests for an interview. Furthermore, Daysog’s actions as a Council member have been less supportive of transit and transit users than we had hoped he would be. I would like to throw my support in for Measure 86 & 87. My mom died of lung cancer. She smoked for approx. 30 year and then quit for 3 years. After being smoke free for 3 years they discovered it early and she fought it for 3 more years and it kept coming back. She was on medicare and cost the system I sure thousands of dollars. I actually think this is a very fair tax because I believe smoking causes more problems then what even this taxe will ever cover. Second, prop 87 (Oil company tax-atlernative energy…) is surely needed. We need some alternatives and if we don’t start now the automobile and oil companies will never do it on themselves. as they make to much money keeping us dependent. I worked closely with bus transit advocates to get City Hall to re-stripe red curbs throughout Alameda to accommodate AC Transit’s modern “low floor” buses. I worked with arts enthusiasts in Alameda to get City Hall to accept and install elegant AC bus shelters free of annoying billboard advertisements. These enthusiasts actually raised the funds to pay for these shelters — and I even helped install them one Saturday morning. I strongly supported transit activists in Alameda to get City Council to pass Alameda’s “Transit First Resolution,” which laid the policy groundwork that led to the designation of Park and Webster Streets as Alameda’s “transit hubs.” Today, these hubs have a number of raised platforms with elegant shelters that facilitate bus service. “Transportation for Livable Communities (TLC).” Background: As part of the TLC application, we had to match MTC funds with local dollars, in this case redevelopment money. I made a point to make sure that, if we didn’t get the MTC TLC funds, the local redevelopment dollars would still be there for Webster Street revitalization. Fortunately, we got the TLC funds. a new locally-based system for when safety signs should be put up, prioritizing areas where children and seniors congregate. It’s hard to believe but, before creation of the “Traffic Calming Guidelines,” every time I worked with residents to install a sign, staff would say they’d have to consult traffic “warrants” that came out of Sacramento — I changed that! never been able to live that one down, either :), as people continue to humorously needle me about that. to wait around for a bus that comes around every 15 to 30 minutes. So, you see, I don’t just “talk” mass transit and alternative modes of transit, because I am a Councilman politician, and it sounds good and it looks good on my resume. But I “live” mass and alternative modes of transit everyday, and want people generally to begin to accept and respect these modes as much as the single-occupancy vehicle, if not more so. But to do that, we’ve got to change policies at the local level and, even before that, educate people about the benefits that accrue to individuals and the masses generally. The long and the short of it is this: I have a solid record in the area of mass transit and alternative modes of transit. I also use mass transit all the time. Above all, I have a solid record in this area of urban planning similarly to why I have a solid record in social justice matters like working to make Alameda an inviting place for gays and lesbians and for people in need of low-income housing, and a place where East End residents didn’t have to worry about a nearby harmful incinerator in Fruitvale [ps: the FBI approached me two weeks ago and we talked at some length about this, thus in an indirect way they were complimenting my leadership role in shutting down this harmful incinerator called IES . . . but that’s a tale I won’t get into now : ) ]. At the end of the day, I am a progressive, and I want to continue my work in this regard at AC Transit. Thank you for taking the time to read this. I’d like to quickly respond here as an advocate of transit, but not for ATA (Alameda Transit Advocates). Tony is correct and we are thankful that 4 years ago he worked with bus transit advocates to get City Hall to re-stripe red curbs throughout Alameda. Tony is also correct that a strain was created by his handling of the bus shelter issue he mentions. Tony leaves out that he ignored requests from both Transportation Commissioners (that would be me) and bus riders when the issue of shelters started to move forward. Tony’s positioning of the ARTS (Alamedans for responsible transit shelters) group as a group of arts (small a) enthusiasts is just plain wrong. They were citizens who were concerned about a) bus shelters in neighborhoods and b) against advertising on bus shelters if they had to be put in. Further, it was Mayor Johnson and City Manager Flint actually met with the ARTS group. As I attended a couple of these meetings, I can report this from personal experience. While Tony was willing to ignore meeting protocol and interrupt my public comment (a subject that both Don Roberts and Pat Bail rail against Tony for doing on other occasions) with a diatribe that was ironic in its use of “condescending” to describe my personal interactions with ARTS. Tony, as you refused to speak with anyone but ARTS and were not involved in any of the actual discussions except at the council where you agreed with the majority, it would be helpful for me (and voters I would imagine) for you to explain which “hammer” you were dropping to make things move forward. I recently confirmed my memory with Mayor Johnson on the issue, she recalls the same process I do. In the past four years, people concerned with transportation issues in Alameda fought hard to save the city’s service from disastrous bus cuts. You were conspicuously absent from any discussions or fights on the matter. Even Barbara Kerr, not a bus advocate herself, went to the mat for service. You were included in all the communications on the issues. But you didn’t show up. The same can be said for the Council/AC Transit Inter-agency Liaison Committee, it was always other council people representing Alameda’s interests and leading the way. Frank Mattaresse and Beverly Johnson have taken the bull by the horns and lead on these issues. When you ran for state Assembly, you listed your greatest achievement in the 8 years (or was it 10?) on the council as requesting that staff put together a traffic calming program for the city. I worked on the plan that they city has and will certainly not deride it, but the fact that even you cannot pinpoint instances of leadership beyond asking for a very popular program to be set up says volumes about what you have accomplished. The “strain” you mention comes not from one instance of nasty, personal attacks when sitting in a position of power, but from a very apparent and abrupt change that occurred over three years ago when you stopped pushing for hard issues and started abstaining on major decisions rather than voting for or against proposals. This incredible indecisiveness concerns me greatly now that you havedecided to not run for Mayor and instead run for AC Transit at the last minute. AC Transit’s board is made up of directors who represent districts. 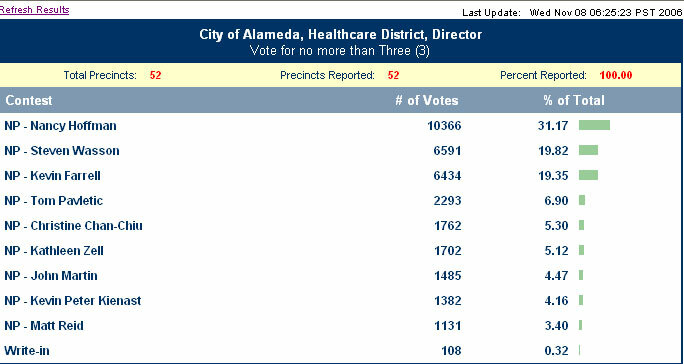 When a director abstains, as you often do, the power of decision making is given to the districts that do not include Alameda. It is solely for this reason that I am not supporting your candidacy. I was a supporter of your council run 4 years ago. I have been saddened by the lack of leadership that you have shown over the past 4 years. (every accomplishment, save the shelters, that you list happened many years ago). Lastly, I will ask, if you take credit for the bus shelter project, do you also take credit for the fact that the council approved a program that included 24 shelters and the fact that to-date, only 6 have been installed? In my opinion running on an issue that is woefully incomplete does not speak volumes about effective leadership. Your attempts to minimize the concerns of transit riders (who you again didn’t respond to when they called to talk to you about the upcoming election) makes me wonder who you’ll be representing if you are elected. Well, what can I say, other to say what was written above confirms the hard feelings between the transit folks and me, which largely stemmed from the bus shelter situation. There’s a lot there that I can argue with, but that will inevitably lead to “he said, he said” that will be a back and forth that’ll lead nowhere. But one matter I will address is the assertion that I wasn’t there when the city faced major cuts to the AC routes in 2003. Truth be told: I was there lobbying for Alameda, speaking out at the special meeting at the Scottish Rites Building next to Oakland’s Lake Merritt. That late afternoon, AC Transit Directors recognized me as a Councilmember and representative of the people by allowing me to speak ahead of the long of a long line of equally concerned bus riders. If folks want to minimize my record in the area of mass and other modes of transit, that’s something I can’t control: but my record and the outcomes stemming from it are there — all around us even right now. Red curbs that accommodated AC’s low-floor buses, new and elegant bus shelters, fighting to save AC, and improved guidelines that made it easier for residents to implement numerous pedestrian safety features you see today. Oh, geez, “new and elegant bus shelters”? A mere six installed out of 24 promised, and the city still stuck with expensive maintenance, which the advertisements were going to pay for. Don’t get me started. Tony, first, I will apologize if you indeed did speak at AC Transit. I checked the minutes of the meeting and saw no reference ( I really did look it up), I am perfectly happy to accept your account and apologize for the mis-representation. Per the bus shelters, just wanted to share my own perspective. My main memory is wishing that you had contacted me much earlier in the process to address your concerns before grandstanding on the dais. That said, (and hard feelings notwithstanding) I remain willing to get together and discuss transit issues with you if you ever again have an interest. Is Tom Pavletic the biggest hypocrite or what? He claims to be against new developments in Alameda due to trafic impacts, yet goes onto buy a house in Bayport!!!! before Bayport, he lived at the housing devopement by Albertson when it was new. Bayport is Measure A compliant. He supports development within the context of Measure A. No hypocrisy. Of course, how can Dave go against diktat of Don Roberts? He has to endorse who his master endorses! Go back and read the link. He is very clear that he supports development within Measure A. No need to be such a diktat about it…. The correct name for ARTS is “Alamedans for Responsible TRANSIT Shelters. Thanks cfor correcting this oversight on your endorsements list.